UM economist Bryce Ward says Montana will need 16,000 additional healthcare workers by 2025. "But at the same time we have a bunch of older healthcare workers that are likely to start leaving the system. So, not only are we going to need new, more people than we have currently, we’re going to have to have to replace a bunch of people that we already have." Replacing retiring healthcare professionals will mean Montana will need to fill an additional 9,000 positions in the next decade. That adds up to a total of 16,000 additional healthcare workers that the state will need. Ward spoke Tuesday at the release of the annual Montana economic outlook report put out by UM’s Bureau of Business and Economic Research. He says there are three things driving the growth in demand for healthcare in Montana. "So we have the insurance expansions under the Affordable Care Act, we have the aging of the population, and then we have healthcare innovation. Those are the things you’re going to look at to try to understand what’s going to happen in healthcare as we go forward." 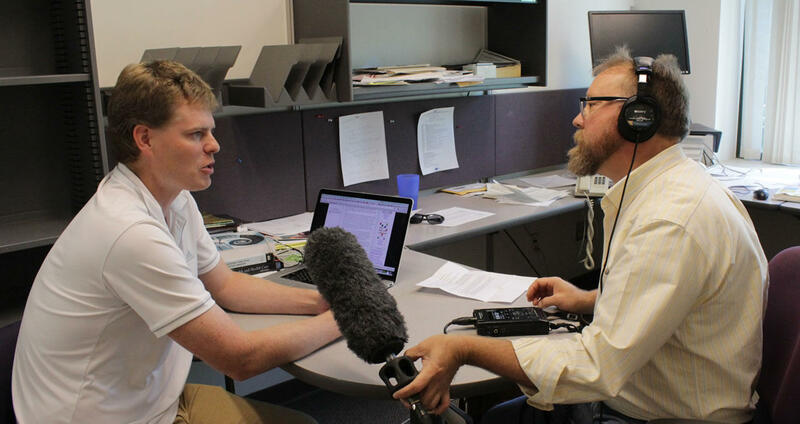 Bryce Ward, the director of health care research at the University of Montana’s BBER, talks with MTPR News Director Eric Whitney. The first one, insurance expansions under the Affordable Care Act, means that now that Americans are legally required to have healthcare, and Montana has expanded Medicaid, a lot more Montanans will have health insurance. And people who have insurance tend to use it, generating more healthcare demand. When Ward talks about healthcare innovation, he means that as new treatments become available, they’ll draw more people in to get healthcare for conditions they’re struggling with now. "The bigger trend is that Montana is getting older. This is the Baby Boom moving through the aging, life cycle process. So, almost a quarter of Montanans within 15 years will be over age 65. Not surprisingly, the older you are, the more healthcare you are likely to consume." A lot more older Montanans, using a lot more healthcare, adds up to some serious economic impact. "In the next 15 years we’re going to add $2.3 billion to Montana’s health care, just from aging people. That’s a 31 percent increase over where it was a few years ago. Just from aging." Ward says that most of that economic boost will probably end up in the three Montana cities where the majority of healthcare jobs and services are already clustered: Billings, Great Falls and Missoula. But, he says, he’s also seeing potential for substantial growth in what are now smaller healthcare markets, including Bozeman. Sunday Is The Deadline For Obamacare Enrollment. Sunday is the deadline to enroll for health insurance coverage under the federal Affordable Care Act for this year. Some Montanans might find out during this year’s enrollment they are now eligible for coverage under the state’s expanded Medicaid. Billings Clinic launched a new project in Montana yesterday that will provide peer support to health care providers across the state. This pilot project will start in the area of addictions and behavioral health for the Montana Department of Corrections. A special council of healthcare executives, doctors, clinic managers and patient advocates are meeting over the next year to try to wring more value from Montana's health dollars. If you got a couple dozen of the most powerful and influential health care leaders in Montana together in a room, they'd tell you that, overall, spending on health care here could be a lot more efficient. That's actually exactly what happened Tuesday in Helena.